I commissioned Pakistan Christian Post in 2001, when Pakistani Christians have not any daily newspaper or online News Media while national media owned by Muslims continuously ignored to cover issues of oppressed and persecuted Christians. Therefore, major objective to launch Pakistan Christian Post was to raise voice for equal basic democratic rights of twenty millions Pakistani Christians to secure their due constitutional share in resources of federation of Pakistan. The Pakistan Christian Post is voice of poor Pakistani Christians, Muslims and other religious minorities around globe who are deprived of their Universal Human Rights as enshrined in UN Human Rights Declaration. There were few Weekly and Monthly Magazines published by different Churches but such remained to cover religious functions of respective Churches and to praise policies of government for their vested interests. To launch an independent news media for Pakistani Christians, I never accepted funds from any Church or any NGO or any other agency but depended on my family finances that true situation of religious minorities may be portrayed. LI launched Print Edition of Pakistan Christian Post from New York for short period of time which was duly distributed in Tri-State area and couriered to four big cities of Pakistan for distribution among Christian community. Unfortunately, we faced difficulties in distribution of Pakistan Christian Post newspaper in Pakistan and Print Edition was suspended in 2006, but Internet edition maintained services for our readers. Keeping in view of an urgent need of standard Christian Daily Newspaper in Pakistan I applied for necessary government permissions which were denied for publication of Pakistan Christian Post from Islamabad and Karachi for reasons known best to Pakistan administration. I am presenting an enhanced online standard web-design of Pakistan Christian Post PCP for our readers and viewers and hope that it will be satisfactory but still I need your suggestions to make it more attractive and reader friendly. The Pakistan Christian Post PCP needs your prayers and support that it may appear in Print Edition in Pakistan soon to highlight issues of poor and down trodden communities. $10,$25,$50,$100, for any one who clicks & wants to donate. 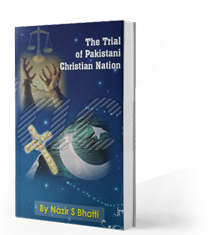 On demand of our readers, I have decided to release E-Book version of "Trial of Pakistani Christian Nation" on website of PCP which can also be viewed on website of Pakistan Christian Congress www.pakistanchristiancongress.org . You can read chapter wise by clicking tab on left handside of PDF format of E-Book. @2018 - Pakistan Christian Post. All Rights Reserved.